Denbro (Denny Brothers) were based in Bury St Edmunds, Suffolk, and produced playing cards during the late 1970s. Spotting a niche in the market, they produced small editions of advertising playing cards for local customers and for a while were able to offer smaller minimum orders than the larger manufacturers such as Waddingtons or Carta Mundi. 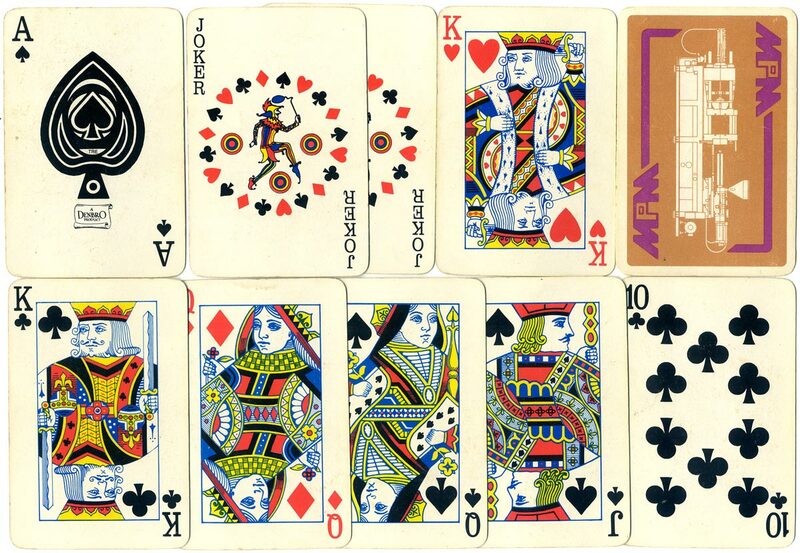 The court cards were inspired by Waddington's "Goodall" designs, but the joker and ace of spades were original designs by Trevor Elmer. Some of their cards were passed through a process of embossing. In 1978/79 the competition began offering lower minimum quantities and pushed Denny Brothers out of the market. Above: rare example of advertising pack manufactured by Denbro for Merit Plastic Mouldings (MPM - established in 1972, www.meritplastics.co.uk). The indices are in a distinctive Clarendon typeface and the courts are based on the designs of Goodall. The Ace of Spades includes the letters TRE, initials of designer Trevor Elmer.